When my parents came to visit, they joined us for Office. For the Marian hymn, every night we darkened the entire chapel with a single candle burning before a small white statue of the Blessed Mother for us to focus on as we chanted the Salve Regina. I remember when the lights came back on my parents’ eyes were as big a saucers. I tell myself it was the coming into the light which caused this. I tell myself. The Alma Redemptoris Mater is one of the four primary Marian hymns sung after Compline. Hermannus Contractus (Herman the Cripple) (1013–1054) is said to have authored the hymn based on the writings of Ss. Fulgentius, Epiphanius, and Irenaeus of Lyon. It is mentioned in “The Prioress’s Tale “, one of Geoffrey Chaucer’s Canterbury Tales. Formerly, it was recited at compline only from the first Sunday in Advent until the Feast of the Purification (February 2). 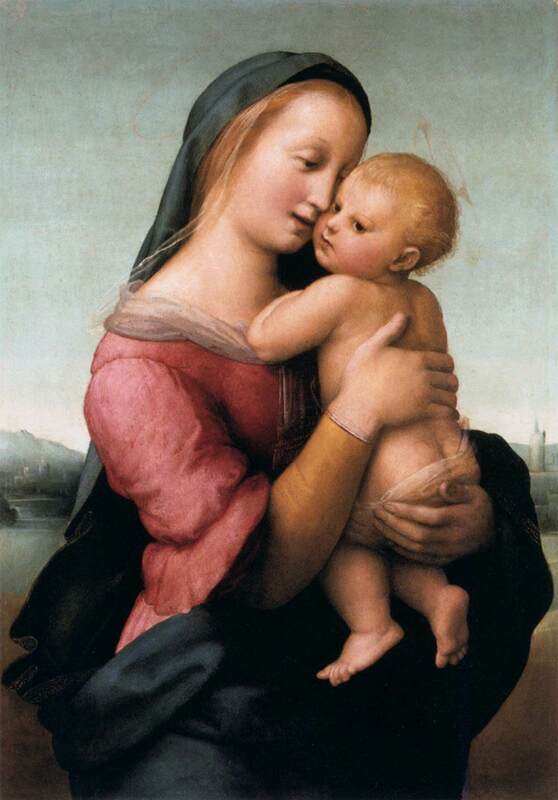 Alma Redemptoris Mater, quae pervia caeli Porta manes, et stella maris, succurre cadenti, Surgere qui curat, populo: tu quae genuisti, Natura mirante, tuum sanctum Genitorem Virgo prius ac posterius, Gabrielis ab ore Sumens illud Ave, peccatorum miserere. V. Angelus Domini nuntiavit Mariae R. Et concepit de Spiritu Sancto. Oremus Gratiam tuam quæsumus, Domine, mentibus nostris infunde; ut qui, angelo nuntiante, Christi Filii tui Incarnationem cognovimus, per passionem ejus et crucem, ad resurrectionis gloriam perducamur. Per eumdem Christum Dominum nostrum. Amen. 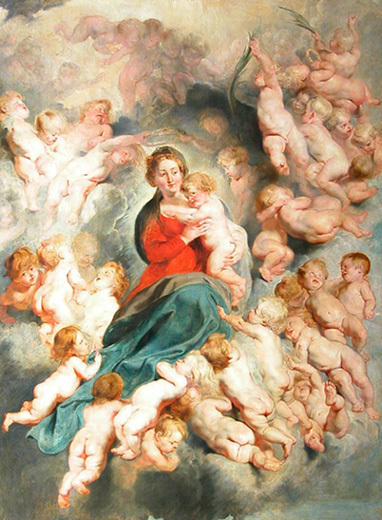 V. Post Partum Virgo inviolata permansisti. R. Dei Genitrix, intercede pro nobis. Oremus Deus, qui salutis aeternae beatae Mariae virginitate foecunda humano generi praemia praestitisti: tribue, quaesumus, ut ipsam pro nobis intercedere sentiamus, per quam meruimus, Auctorem vitae suscipere Dominum nostrum Jesum Christum Filium tuum. Amen. Loving Mother of our Savior, hear thou thy people’s cry Star of the deep and Portal of the sky! Mother of Him Who thee from nothing made. Sinking we strive and call to thee for aid: Oh, by what joy which Gabriel brought to thee, thou Virgin first and last, let us thy mercy see. V. The Angel of the Lord declared unto Mary R. And she conceived by the Holy Ghost. Let us pray. Pour forth we beseech Thee, O Lord, Thy grace into our hearts, that we to whom the Incarnation of Christ, Thy Son, was made known by the message of an angel, may, by His passion and cross, be brought to the glory of His Resurrection; through the same Christ, our Lord. Amen. V. After childbirth, O Virgin, thou didst remain inviolate. R. O Mother of God, plead for us. Let us pray. O God, Who by the fruitful virginity of blessed Mary, hast given to mankind the rewards of eternal salvation: grant, we beseech You, that we may experience her intercession for us, by whom we deserved to receive the Author of life, our Lord Jesus Christ, Your Son. Amen. Wyoming Catholic College choir does beautiful renditions of this hymn. Male & female choir with deep baritone and bass male voices, up-tempo, and the joyful zeal of youth. VERY worth the five bucks if you are looking to beef up your Christmas music collection. Trust me. I have it on my iPhone with all my other weirdo MPM music. The Roman Catholic Church sees the divisions among Christians as scandalous. It believes the Lord views these divisions similarly. The Church seeks to heal these divisions. Jn 17:21-23. Divisions in Christianity are a disincentive to non-Christians to consider Jesus Christ and an impediment to Christian agape among Christians. It is reported Gandhi read the New Testament every day. Upon seeing this, a British reporter asked if The Mahatma, Great Soul, intended to become Christian. Gandhi responded he would if he ever met one. “You’re Christ I like” he said. The energetic life of Peter Canisius should demolish any stereotypes we may have of the life of a saint as dull or routine. Peter lived his 76 years at a pace which must be considered heroic, even in our time of rapid change. A man blessed with many talents, Peter is an excellent example of the scriptural man who develops his talents for the sake of the Lord’s work. The restoration of the Catholic Church in Germany after the Reformation is attributed to his work. He was one of the most important figures in the Catholic Reformation in Germany. His was such a key role that he has often been called the “second apostle of Germany” in that his life parallels the earlier work of St Boniface (June 5). Both Holland and Germany claim him as their son, for Nijmegen, then in the Duchy of Guelders (until 1549 part of the Spanish Netherlands within the Holy Roman Empire) where he was born, Peter Kanis, May 8th, 1521, though a Dutch town today, was at that time in the ecclesiastical province of Cologne and had the rights of a German city. Peter’s mother, Ægidia van Houweningen, died shortly after Peter’s birth. His father, Jacob Kanis, a Catholic and nine times burgomaster of Nijmegen, sent him at the age of fifteen to the University of Cologne, where he met the saintly young priest, Nicolaus van Esch. It was he who drew Canisius into the orbit of the loyal Catholic party of Cologne, which had been formed in opposition to the archbishop, Hermann von Wied, who had secretly gone over to the Lutherans. Canisius was chosen by the group to approach the emperor, and the deposition of the archbishop which followed averted a calamity from the Catholic Rhineland. 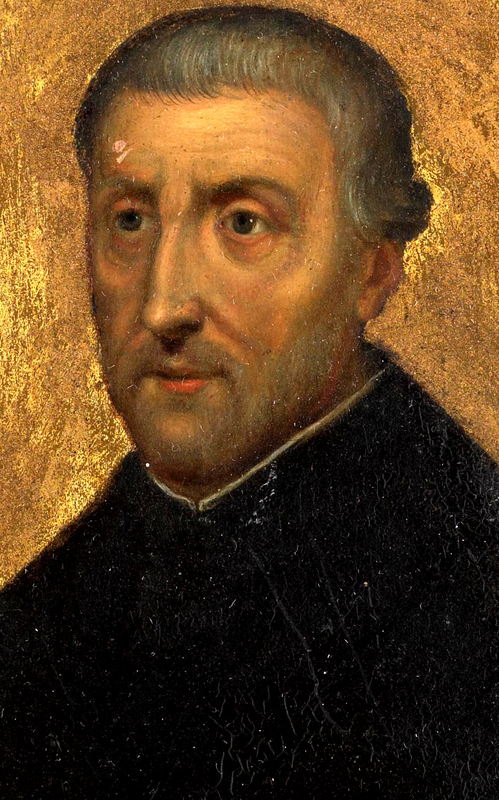 St Peter Canisius exerted a strong influence on Holy Roman Emperor Ferdinand I; he ceaselessly reminded Ferdinand of the imminent danger to his soul should he concede more rights to Protestants in return for their military support. When Peter Canisius sensed a very real danger of Ferdinand’s son and heir, King Maximilian, openly declaring himself a Protestant, he convinced Emperor Ferdinand to threaten disinheritance should Maximilian desert the Catholic Faith. Although Peter once accused himself of idleness in his youth, he could not have been idle too long, for at the age of 19 he received a master’s degree from the university at Cologne. Soon afterwards he met Blessed Peter Faber, SJ, the first disciple of Ignatius Loyola, and underwent the Spiritual Exercises under his direction. Faber influenced Peter so much that he joined the recently formed Society of Jesus. 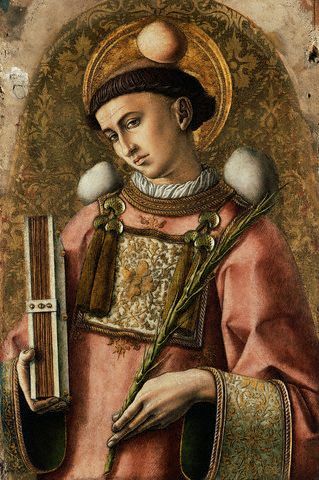 At this early age Peter had already taken up a practice he continued throughout his life—a process of study, reflection, prayer and writing. After his ordination in 1546, he became widely known for his editions of the writings of St. Cyril of Alexandria and St. Leo the Great. Besides this reflective literary bent, Peter had a zeal for the apostolate. He could often be found visiting the sick or prisoners, even when his assigned duties in other areas were more than enough to keep most people fully occupied. Recalled to Rome in 1549 to make his final profession in the presence of St Ignatius of Loyola himself who was his spiritual director and traveling companion and the founder of the Society of Jesus, he was entrusted with what was to become his life’s work: the mission to Germany. At the request of the duke of Bavaria, Canisius was chosen with two other Jesuits to profess theology in the University of Ingolstadt. Soon he was appointed rector of the University, and then, through the intervention of King Ferdinand of the Romans, he was sent to do the same kind of work in the University of Vienna. It was at this period, 1555, that he issued his famous Catechism, one of his greatest services to the Church. With its clear and popular exposition of Catholic doctrine it met the need of the day, and was to counter the devastating effect of Luther’s Catechism. In its enlarged form it went into more than four hundred editions by the end of the seventeenth century and was translated into fifteen languages. For many years during the Protestant Reformation, Peter saw the students in his universities swayed by the flashy speeches and the well-written arguments of the Protestants. Peter was not alone in wishing for a Catholic catechism that would present true Catholic beliefs undistorted by fanatics. Finally King Ferdinand himself ordered Peter and his companions to write a catechism. This hot potato got tossed from person to person until Peter and his friend Fr. Lejay were assigned to write it. Lejay was obviously the logical choice, being a better writer than Peter. So Peter relaxed and sat back to offer any help he could. When Father Lejay died, King Ferdinand would wait no longer. Peter said of writing: “I have never learned to be elegant as a writer, but I cannot remain dumb on that account.” The first issue of the Catechism appeared in 1555 and was an immediate success. Peter approached Christian doctrine in two parts: wisdom — including faith, hope, and charity — and justice — avoiding evil and doing good, linked by a section on sacraments. As intent as Peter was on keeping people true to the Catholic faith, he followed the Jesuit policy that harsh words should not be used, that those listening would see an example of charity in the way Catholics acted and preached. However, his companions were not always as willing. He showed great patience and insight with one man, Father Couvillon. Couvillon was so sharp and hostile that he was alienating his companions and students. Anyone who confronted him became the subject of abuse. It became obvious that Couvillon suffered from emotional illness. But Peter did not let that knowledge blind him to the fact that Couvillon was still a brilliant and talented man. Instead of asking Couvillon to resign he begged him to stay on as a teacher and then appointed him as his secretary. Peter thought that Couvillon needed to worry less about himself and pray more and work harder. He didn’t coddle him but gave Couvillon blunt advice about his pride. Coming from Peter this seemed to help Couvillon. 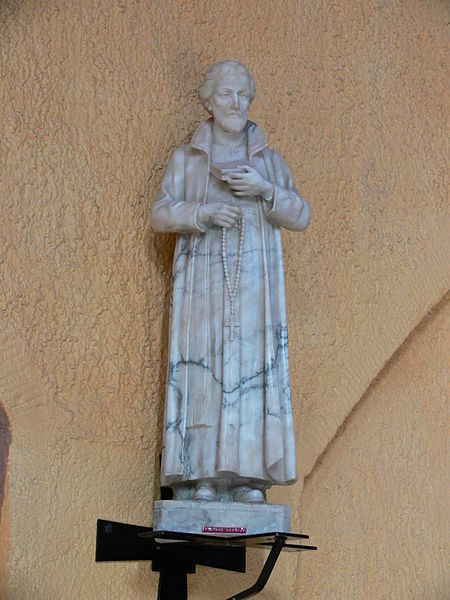 Peter consulted Couvillon often on the business of the Province and asked him to translate Jesuit letters from India. Thanks to Peter , even though Couvillon continued to suffer depression for years, he also accomplished much good. From Vienna, Canisius passed on to Bohemia, where the condition of the church was desperate. In the face of determined opposition he established a college at Prague which was to develop into a university. Named Provincial of southern Germany in 1556, he established colleges for boys in six cities, and set himself to the task of providing Germany with a supply of well-trained priests. This he did by his work for the establishment of seminaries, and by sending regular reinforcements of young men to be trained in Rome. 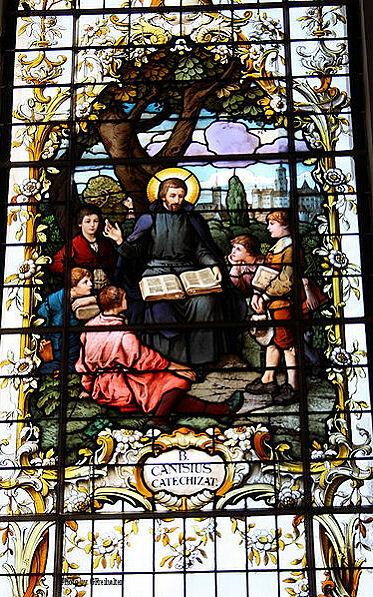 On his many journeys in Germany St Peter Canisius, SJ never ceased from preaching the word of God. He often encountered apathy or hostility at first, but as his zeal and learning were so manifest great crowds soon thronged the churches to listen. For seven years he was official preacher in the cathedral of Augsburg, and is regarded in a special way as the apostle of that city. Whenever he came across a country church deprived of its pastor, he would halt there to preach and to administer the sacraments. It seemed impossible to exhaust him: ‘If you have too much to do, with God’s help you will find time to do it all,’ he said, when someone accused him of overworking himself. Another form of his apostolate was letter writing, and the printed volumes of his correspondence cover more than eight thousand pages. Like St Bernard of Clairvaux he used this means of comforting, rebuking and counseling all ranks of society. As the needs of the church or the individual required, he wrote to pope and emperor, to bishops and princes, to ordinary priest and laymen. Where letters would not suffice he brought to bear his great powers of personal influence. Thus at the conference between Catholics and Protestants held at Worms in 1556, it was due to his influence that the Catholics were able to present a united front and resist Protestant invitations to compromise on points of principle. In Poland in 1558 he checked an incipient threat to the traditional faith of the country; and in the same year, he earned the thanks of Pope Pius IV for his diplomatic skill in healing a breach between the pope and the emperor. This gift of dealing with men led to his being entrusted in 1561 with the promulgation in Germany of the decrees of the council of Trent. Shortly afterwards he was called on to answer the Centuries of Magdeburg. This work, ‘the first and worst of all Protestant church histories,’ was a large-scale attack on the Catholic church, and its enormous distortions of history would have required more than one mar to produce an adequate answer. 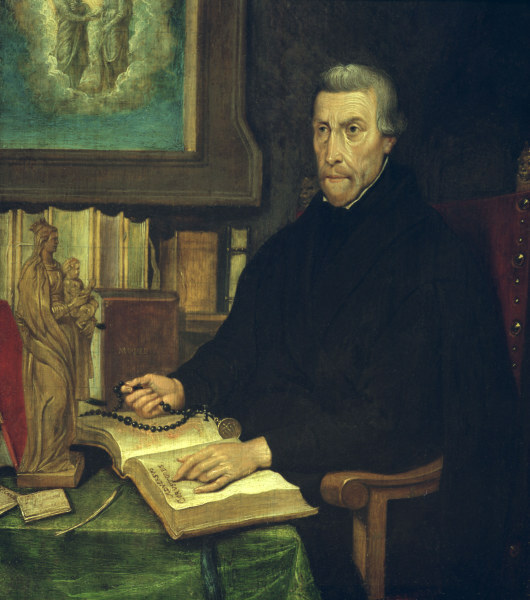 Yet Peter Canisius showed the way by his two works, The History of John the Baptist, and, also theologically defended Catholic Mariology in, The Incomparable Virgin Mary/Opus Marianum, or “De Maria Virgine Incomparabili et Dei Genitrice Sacrosancta Libri Quinque”, receiving high praise from St John Eudes as a Marian teacher. Canisius taught that while there are many roads leading to Jesus Christ, Marian veneration is the best way to him. His sermons and letters document a clear preoccupation with Marian veneration. Under the heading “prayer” he explains the Ave Maria, Hail Mary, as the basis for Catholic Marian piety. Less known are his Marian books, in which he published prayers and contemplative texts. He is credited with adding to the Hail Mary the sentence “Holy Mary, Mother of God, pray for us sinners.” Eleven years later it was included in the Catechism of the Council of Trent of 1566. In 1565, the Vatican was looking for a nuncio to deliver the decrees of the Council of Trent to the loyal bishops of Germany. What would be a simple errand in our day, was a dangerous assignment in the sixteenth century. The first envoy who tried to carry the decrees through territory of hostile Protestants and vicious thieves was robbed of the precious documents. Rome needed someone courageous but also someone above suspicion. 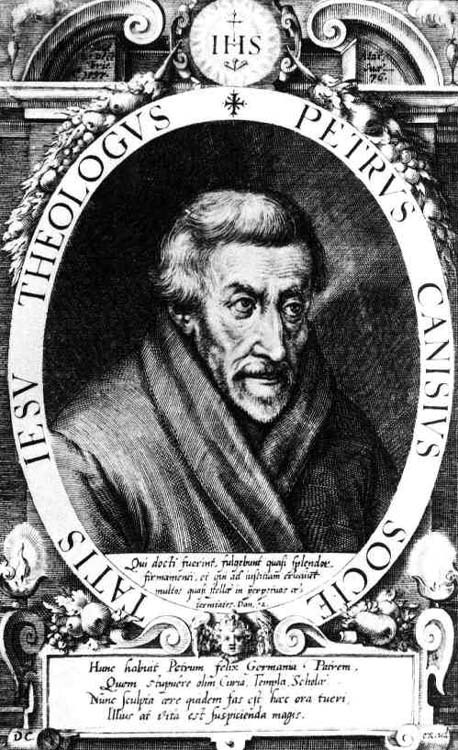 They chose Peter Canisius, who had reformed German universities from heresy. At 43 he was a well-known Jesuit who had founded colleges that even Protestants respected. They gave him a cover as official “visitor” of Jesuit foundations. But Peter couldn’t hide the decrees like our modern fictional spies with their microfilmed messages in collar buttons or cans of shaving cream. Peter traveled from Rome and crisscrossed Germany successfully loaded down with the Tridentine tomes — 250 pages each — not to mention the three sacks of books he took along for his own university! Renowned as a popular preacher, Peter packed churches with those eager to hear his eloquent proclamation of the gospel. He had great diplomatic ability, often serving as a reconciler between disputing factions. In his letters (filling eight volumes) one finds words of wisdom and counsel to people in all walks of life. At times he wrote unprecedented letters of criticism to leaders of the Church—yet always in the context of a loving, sympathetic concern. At 70 Peter suffered a paralytic seizure, but he continued to preach and write with the aid of a secretary until his death in his hometown (Nijmegen, Netherlands) on December 21, 1597. His body was interred before the high altar of the Church of Saint Nicholas in Fribourg. His relics were translated to the Church of Saint Michael at the Jesuit College in Fribourg in 1625. From 1580 until his death in 1597 he labored and suffered much in Switzerland. His last six years were spent in patient endurance and long hours of prayer in the college of Fribourg, now that broken health had made further active work impossible. Soon after his death, December 21st, 1597, his tomb began to be venerated, and numerous miracles were attributed to his intercession. He had the unique honor of being canonized and declared a doctor of the church on the same day, June 21st, 1925. Peter’s untiring efforts are an apt example for those involved in the renewal of the Church or the growth of moral consciousness in business or government. He is regarded as one of the creators of the Catholic press, and can easily be a model for the Christian author or journalist. Teachers can see in his life a passion for the transmission of truth. 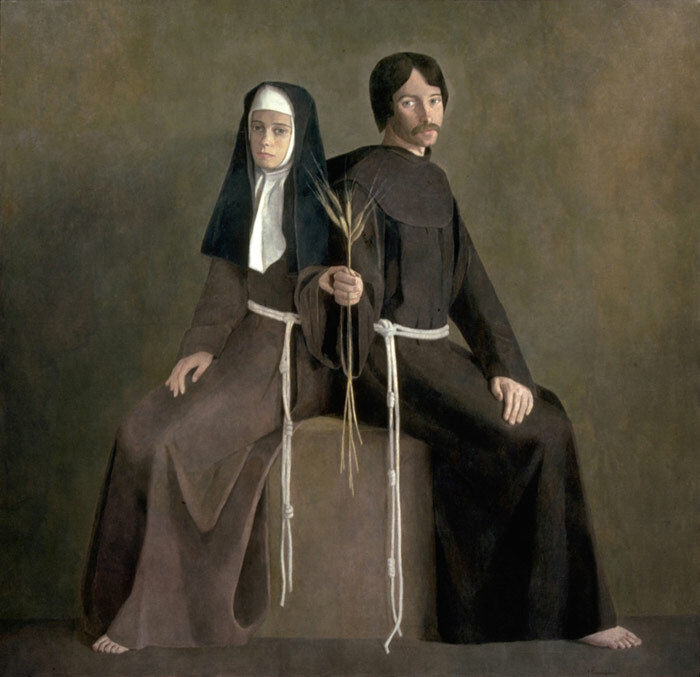 Whether we have much to give, as Peter Canisius did, or whether we have only a little to give, as did the poor widow in the Gospel (see Luke 21:1–4), the important thing is to give our all. It is in this way that Peter is so exemplary for Christians in an age of rapid change when we are called to be in the world but not of the world. 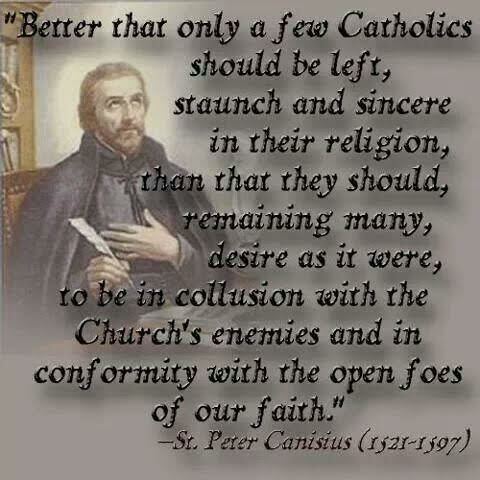 -St Peter Canisius, SJ, as edited by Fr. James Brodrick, SJ, (Jesuit Way — an imprint of Loyola Press) 62. St. Peter sent his mother an image of Our Lady and counseled her to turn all her troubles and anxieties over to the stricken heart of the Queen of Heaven. Today, when I see my image of Our Lady, I will follow the advice of St. Peter Canisius, Doctor of the Church, and turn my troubles over to Our Lady. -St Peter Canisius, SJ, as edited by Fr. Christopher Rengers, O.F.M. Cap., The 33 Doctors of the Church, (Tan Books: 2000), p. 473. Saint Peter Canisius, you saw the good in even the most troublesome of people. You found their talents and used them. Help me to see beyond the behavior of others that may bother me to the gifts God has given them. Amen. 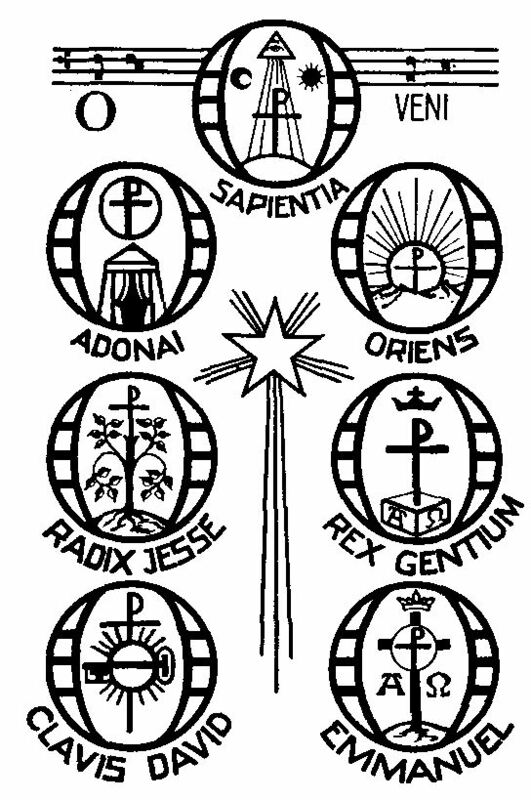 Dec 17-23: Great O Antiphons!!!!! Beginning on Dec. 17, the Church prays with greater urgency for the hastening of Christ’s arrival. A greater sense of insistence and impatience is found in the prayers and liturgy of the Church at this time just immediately before the memorial of the Incarnation and, hence, our salvation. At Vespers each night, the Church sings the great “O Antiphons” before the Magnificat, beckoning for He Who is Wisdom from on High, Lord of Might, Rod of Jesse’s stem, Key of David, Dayspring from on high, King of the Nations, and Emmanuel, He Who made the Heavens and the Earth to come and pitch His tent among us. These antiphons have likewise made their way into the culture of Christmas music that you hear at stores and on radio stations, not to mention most Catholic churches, in the form of the hymn “O Come O Come Emmanuel”, which bases its verses on the O Antiphons. The authors of these antiphons, they can be traced liturgically and historically back to the fourth century, not only had a great theological insight into the arrival of the Christ as expressed in each of the individual antiphons, but they also ordered them so that when they are read backwards chronologically from the 23rd to the 17th, the titles of Christ in Latin form an acronym which spells “ERO CRAS” – I will come tomorrow. “Yesterday we celebrated the birth in time of our eternal King. Today we celebrate the triumphant suffering of His soldier. Yesterday our King, clothed in His robe of flesh, left His place in the virgin’s womb and graciously visited the world. Today His soldier leaves the tabernacle of his body and goes triumphantly to heaven. John Stone was a Doctor of Theology, living in the Augustinian friary at Canterbury, England. The place where the Augustinian friary once stood on St George’s Street is still called Whitefriars. During the time of the Reformation, Stone publicly denounced the behavior of King Henry VIII from the pulpit of the Austin Friars and stated his approval of the status of monarch’s first marriage — clearly opposing the monarch’s wish to gain a divorce. The Act of Supremacy of 1534 declared the king to be the only supreme head of the Church in England. This was followed by the Treasons Act which enjoined the penalty of high treason on anyone who might maliciously desire to deprive the king of his title of supreme head of the Church. All bishops, priests and religious were required to acknowledge his title. On 14 December 1538, the Anglican bishop of Dover, Richard Ingworth, a former Dominican, visited Canterbury and called on the Augustinian friary with an order to close it down as part of the dissolution of monasteries in England. Every friar was forced to sign a formal document agreeing to the Act of Supremacy; Stone refused to sign. After being held in the Tower of London for some time he was sent back to Canterbury to be tried under the Treasons Act. He was found guilty and sentenced to death. He is probably the Austin Friar of whom Ingworth complained on 14 December, 1538, that “at all times he still held and still desired to die for it, that the king may not be head of the Church of England”. 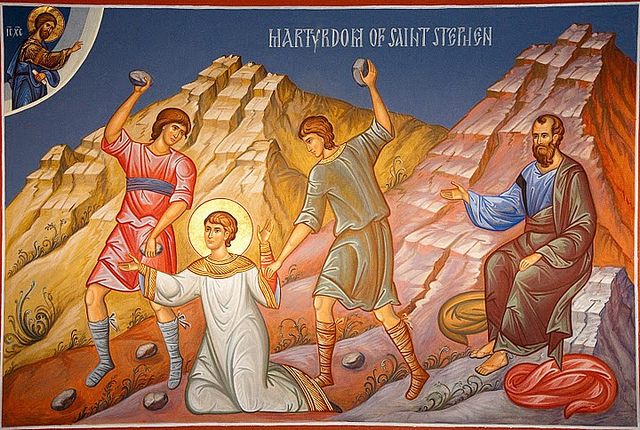 When in prison before his martyrdom “after an uninterrupted fast of three days, he heard a voice, but without seeing the presence of anyone, calling him by name and exhorting him to be of good courage and not to hesitate to suffer with constancy for the truth of the opinion which he had professed”. 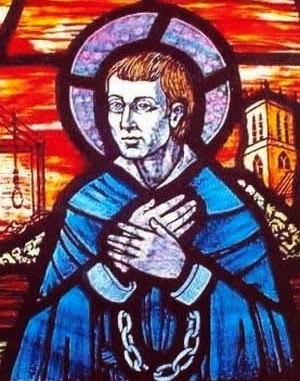 Before his execution at the Dane John (Dungeon Hill), Canterbury, Friar John Stone said: “I close my apostolate in my blood. In my death I shall find life, for I die for a holy cause, the defense of the Church of God, infallible and immaculate”. The picture of St John Stone in his prison cell awaiting execution is from an engraving which was printed in 1612 at Liege in a volume by Georges Maigret Buillonoy (1573 – 1633), O.S.A. Cor unum et anima una in Deum! = One heart and one soul to God! My novice master, Fr. Ambrose Eckinger, O.P., previously a barber in secular life, who insisted as part of our poverty we learn to cut each other’s hair!, silliest thing I ever was ordered to do, IMHO, and a cliché rotund friar, think jovial cookie jar, an excellent organist, and whose Christian name was previously Joseph, had just returned from Rome prior to accepting the office of novice master for the province of St Joseph. There he collected “goodies”. One of the “goodies” he collected were religious medals only to be found in Rome – the good stuff, literally. Cannot be had/found here, for any price. Novices and postulants to Catholic religious orders are held in special affection as the youngest, as children would be in a family, and as the future and the potential glory of the Order in the service of God Himself, alone. In some monasteries, the normal order of seniority, aka, order of religion, as in whom entered the order the earliest, not necessarily strictly age, is reversed on the feast, as a kind of humor and lesson in humility for all. On the Feast of the Holy Innocents 1988, Fr. Ambrose presented to each novice a medal of the Holy Innocents containing a third class relic (LONG, technical explanation, if you are not familiar). It being very fine, I placed mine on the beautiful, fine, nicest I EVER received, saw, was given, made in France rosary given me by the very young, blonde, most attractive Dominican Sister of Nashville, for whose grade school class I was mascot. You’re not really Catholic until you’ve got many, high quality, jingly-jangly, coveted religious medals, four to a Pater Noster, as you WORK the beads!, hanging from the rosary you will be buried with, or hope to. The rosary is held in special esteem by the Order of Preachers. By legend, given to St Dominic himself by the Blessed Mother, it is the Dominican sword, always worn to the left by the right-handed and vice-versa for easy and immediate withdrawal from the scabbard as a spiritual weapon. And, oh, what a weapon. Just ask the Saracens at Lepanto! We keep that rosary in the safe deposit box along with the wills, jewels, emeralds, diamonds, rubies, krugerrands, (just kidding on the rubies), and other items I require I be buried with including most touching letters of thanks I have received from survivors of clergy sexual abuse. Proof for Jesus, upon my Resurrection, as if He needed any. Kelly has express instructions. God have mercy on our souls. I believe God and a mother’s love are the two most powerful forces in the Universe. I witnessed this as a son. I witness this even more profoundly and have ever more irrefutable proof of said every day. I stagger back and fall down. My breath is withdrawn from me. I tremble, literally, in fear, so powerful is this force. The very incarnation (small “I”) of God’s love for His people. I am not being facetious. Fatherhood has NOTHING analogous. With palms and crowns, ye seem to play. Patroness of, and included among those opposed by Church authorities, including: St Elizabeth Ann Seton, St Joan of Arc, and St Teresa of Avila. Known as “The Lady of Mercy”. Named “Quah-kah-ka-num-ad” = “Woman-who-prays-always” by the Potawatomi, St Rose Phillipine Duchesne is a model of Christian love, faith, and perseverance. Born in Grenoble, France, of a family that was among the newly rich, Philippine learned political skills from her father and a love of the poor from her mother. The dominant feature of her temperament was a strong and dauntless will, which became the material—and the battlefield—of her holiness. She entered the convent at 19 without telling her parents and remained despite their opposition. As the French Revolution broke, the convent was closed, and she began taking care of the poor and sick, opened a school for street urchins and risked her life helping priests in the underground. When the situation cooled, she personally rented her old convent, now a shambles, and tried to revive its religious life. The spirit was gone, and soon there were only four nuns left. They joined the infant Society of the Sacred Heart, whose young superior, St. Madeleine Sophie Barat, would be her lifelong friend. In a short time Philippine was a superior and supervisor of the novitiate and a school. But her ambition, since hearing tales of missionary work in Louisiana as a little girl, from a Jesuit missionary, was to go to America and work among the Indians. At 49, she thought this would be her work. With four nuns, she spent 11 weeks at sea en route to New Orleans during which time disease nearly killed her, and seven weeks more on the Mississippi to St. Louis, which also nearly killed her. She then met another of the many disappointments of her life. The bishop had no place for them to live and work among Native Americans. Instead, he sent her to what she sadly called “the remotest village in the U.S.,” St. Charles, Missouri. With characteristic drive and courage, she founded the first free school for girls west of the Mississippi. St Rose Phillipine Duchesne went on to found six other Sacred Heart houses including schools and orphanages. She struggled since her teaching methods were based on French models and her English was terrible, but everyone could see the purity of her intentions. Finally, at 72, in poor health and retired, she got her lifelong wish. A mission was founded at Sugar Creek, Kansas, among the Potawatomi. She was taken along. Though she could not learn their language, they soon named her “Woman-Who-Prays-Always.” While others taught, she prayed. Legend has it that Native American children sneaked behind her as she knelt and sprinkled bits of paper on her habit, and came back hours later to find them undisturbed. She died in 1852 at the age of 83. She spent her last ten years in retirement in a tiny shack at the convent in Saint Charles, Missouri where she lived austerely and in constant prayer. Divine grace channeled her iron will and determination into humility and selflessness, and to a desire not to be made superior. Still, even saints can get involved in silly situations. In an argument with her over a minor change in the sanctuary, a priest threatened to remove her tabernacle. She patiently let herself be criticized by younger nuns for not being progressive enough. Through it all, 31 years, she hewed to the line of a dauntless love and an unshakable observance of her religious vows. Setback after setback after setback, even into old age! This woman of bronze—St. 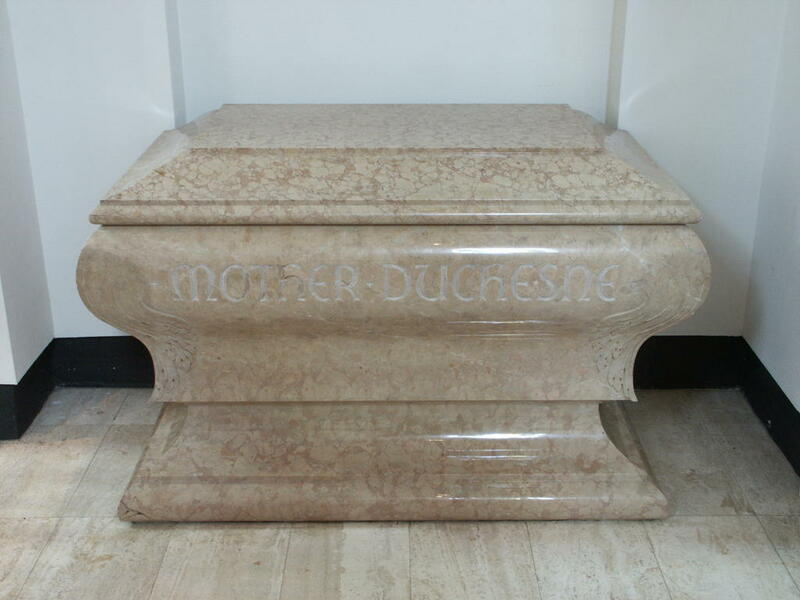 Rose Philippine Duchesne—let nothing stop her, nothing discourage her, nothing slow her down. We can do almost anything for God if we refuse to be discouraged and are willing to pay the price: the price is something called holiness. 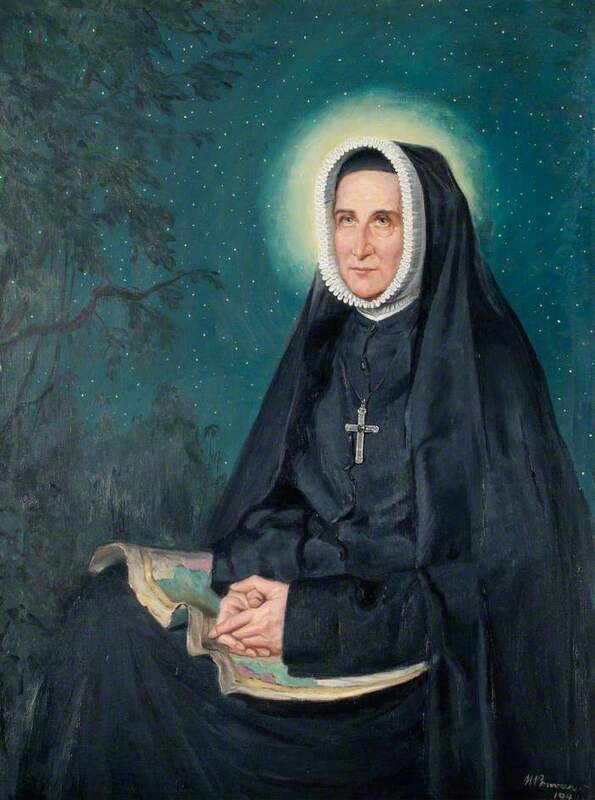 Gracious God, you filled the heart of Philippine Duchesne with charity and missionary zeal, and gave her the desire to make you known among all peoples. Fill us who honor her memory today, with that same love and zeal to extend your kingdom to the ends of the earth. We ask this through our Lord Jesus Christ, your Son, who lives and reigns with you and the Holy Spirit, one God for ever and ever. Barney Casey became one of Detroit’s best-known priests even though he was not allowed to preach formally or to hear confessions! Barney came from a large family in Oak Grove, Wisconsin. At the age of 21, and after he had worked as a logger, a hospital orderly, a streetcar operator and a prison guard, he entered St. Francis Seminary in Milwaukee—where he found the studies difficult. He left there and, in 1896, joined the Capuchins in Detroit, taking the name Solanus. His studies for the priesthood were again arduous. On July 24, 1904, he was ordained, but because his knowledge of theology was judged to be weak, Father Solanus was not given permission to hear confessions or to preach. A Franciscan Capuchin who knew him well said this annoying restriction “brought forth in him a greatness and a holiness that might never have been realized in any other way.” During his 14 years as porter and sacristan in Yonkers, New York, the people there recognized him as a fine speaker. “For, though he was forbidden to deliver doctrinal sermons,” writes his biographer, James Derum, “he could give inspirational talks, or feverinos, as the Capuchins termed them”. His spiritual fire deeply impressed his listeners. 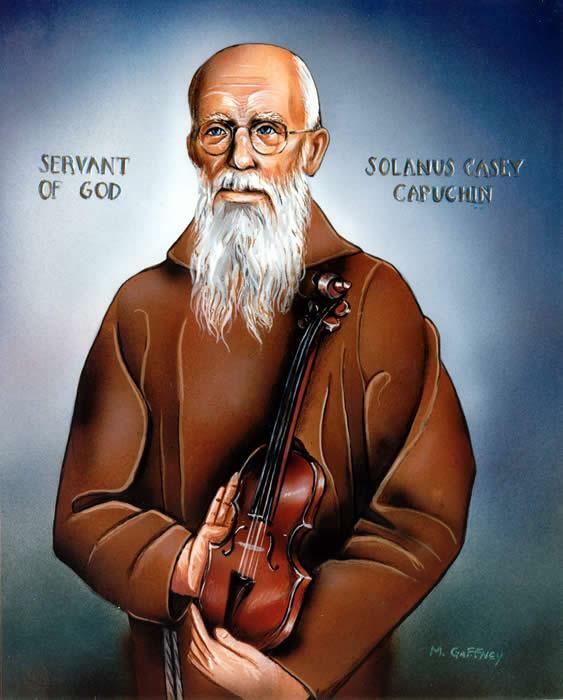 The many friends of Father Solanus helped the Capuchins begin a soup kitchen during the Depression. Capuchins are still feeding the hungry there today. In 1946 in failing health, he was transferred to the Capuchin novitiate in Huntington, Indiana, where he lived until 1956 when he was hospitalized in Detroit. He died on July 31, 1957. An estimated 20,000 people passed by his coffin before his burial in St. Bonaventure Church in Detroit. In 1960 a Father Solanus Guild was formed in Detroit to aid Capuchin seminarians. By 1967 the guild had 5,000 members—many of them grateful recipients of his practical advice and his comforting assurance that God would not abandon them in their trials. He was declared Venerable in 1995. James Patrick Derum, Father Solanus’ biographer, writes that eventually Father Solanus was weary from bearing the burdens of the people who visited him. “Long since, he had come to know the Christ-taught truth that pure love of God and one’s fellowmen as children of God, are in the final event all that matter. Living this truth ardently and continuously had made him, spiritually, a free man—free from slavery to passions, from self-seeking, from self-indulgence, from self-pity—free to serve wholly both God and man”. Truly, it is not through our efforts or talents or skill or virtue or lack thereof that the Church has persisted these two millenia or will persist or will be changed for the better, in this world, in this life; quite frankly, it is in spite of such or its lack. Only inasmuch as those things cooperate with, in and through His Grace, does the Church persist and will persist and grow in holiness. He is its One Foundation. 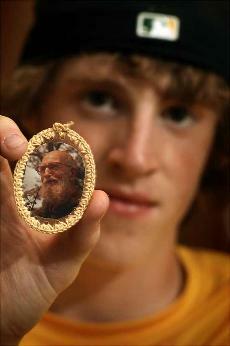 -Ryan Blute, who credits his cure from cancer to the intercession of Ven Solanus “Barney” Casey. The high school junior keeps a relic of Solanus in his wallet when he goes for scans at the hospital and when he took the SAT. “When I need help, he’s always with me,” Ryan said. The Basilica of Saint John Lateran is the cathedral of Rome. It was built during Constantine’s reign and was consecrated by Pope Saint Sylvester I in 324 AD. That church and the adjoining palace were destroyed during the “Babylonian Captivity”, or Avignon Papacy. The current structure Pope Innocent X commissioned in 1646. One of Rome¹s most imposing churches, the Lateran¹s towering facade is crowned with 15 colossal statues of Christ, John the Baptist, John the Evangelist and 12 doctors of the Church. Beneath its high altar rest the remains of the small wooden table on which tradition holds St. Peter himself celebrated Mass. As the cathedral of the Bishop of Rome, containing the papal throne (Cathedra Romana), it ranks above all other churches in the Roman Catholic Church, even above St. Peter’s Basilica in the Vatican. The basilica itself stands over the remains of the Castra Nova equitum singularium, the ‘new fort’ of the imperial cavalry bodyguard. The fort had been established by Septimius Severus in AD 193, but following the victory over Maxentius (whom the Equites singulares augusti had fought for) at the Battle of the Milvian Bridge by Constantine I the guard were abolished and the fort demolished. Substantial remains of the fort lie directly beneath the basilica nave. The rest of the Basilica site was occupied during the early Roman Empire by the palace of the gens Laterani. The Laterani served as administrators for several emperors; Sextius Lateranus was the first plebeian to attain the rank of consul. One of the Laterani, Consul-designate Plautius Lateranus, became famous for being accused by Nero of conspiracy against the emperor. The accusation resulted in the confiscation and redistribution of his properties. The Lateran Palace fell into the hands of the emperor when Constantine I married his second wife Fausta, sister of Maxentius. Known by that time as the “Domus Faustae” or “House of Fausta,” the Lateran Palace was eventually given to the Bishop of Rome by Constantine. The actual date of the gift is unknown but scholars believe it had to have been during the pontificate of Pope Miltiades, in time to host a synod of bishops in 313 that was convened to challenge the Donatist schism, declaring Donatism as heresy. The palace basilica was converted and extended, eventually becoming the cathedral of Rome, the seat of the popes as bishops of Rome. Every pope from Miltiades occupied the Lateran Palace until the reign of the French Pope Clement V, who in 1309 decided to transfer the official seat of the Catholic Church to Avignon, a papal fief that was an enclave within France. How and why that happened is a, some say very, long story I will spare you at the moment. During the Avignon papacy, the Lateran Palace and the basilica began to decline. Two destructive fires ravaged the Lateran Palace and the basilica, in 1307 and again in 1361. In both cases, the Avignon papacy sent money to their bishops in Rome to cover the costs of reconstruction and maintenance. 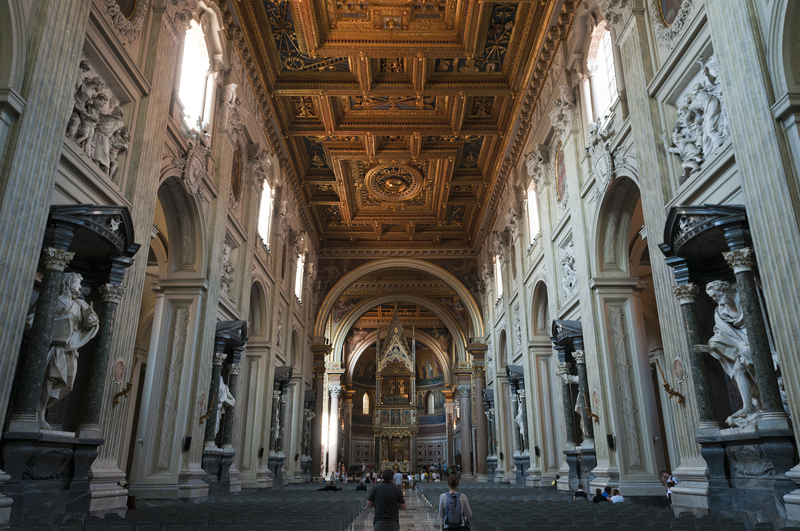 Despite the action, the Lateran Palace and the basilica lost their former splendor. When the Avignon papacy formally ended and the Bishop of Rome again resided in Rome, the Lateran Palace and the basilica were deemed inadequate considering the accumulated damage. The popes took up residency at the Basilica di Santa Maria in Trastevere and later at the Basilica di Santa Maria Maggiore. Eventually, the Palace of the Vatican was built (adjacent to the Basilica of St. Peter, that already existed at the Vatican since the time of Constantine), and the papacy moved in; the papacy remains there today. This feast was later made a universal celebration in honor of the basilica in reflection of the basilica’s primacy in the world as mother church. 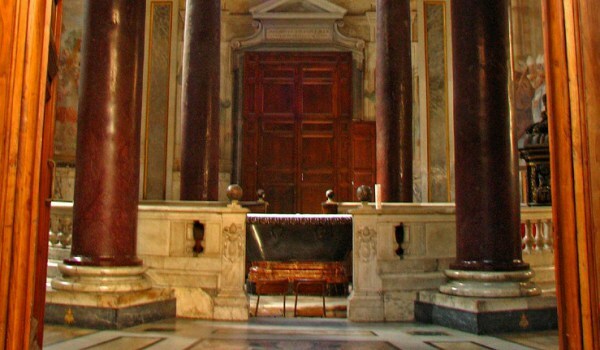 The words: “Sacrosancta Lateranensis ecclesia omnium urbis et orbis ecclesiarum mater et caput” are incised in the main door, meaning “Most Holy Lateran Church, of all the churches in the city and the world, the mother and head.”. This feast was established as a sign of love for and union with the See of Saint Peter for the entire Universal Church. 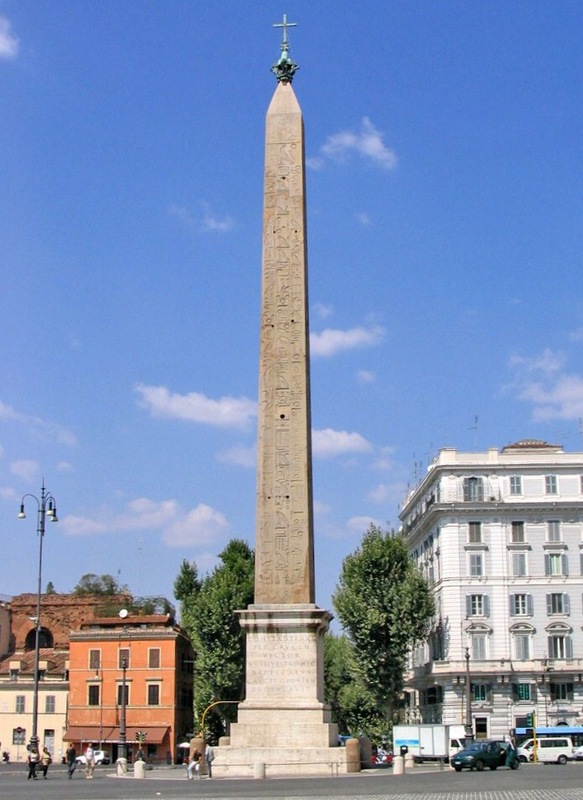 The square in front of the Lateran Palace has a red-granite obelisk, the largest in the world, commissioned by Pharaoh Thuthmose III and completed by his grandson Thutmose IV in Karnak, and placed in the Circus Maximus before being re-erected in its current place. Truly, suggestive of, to me, King of Kings. Clare and Francis both embraced the proposition of Gregory the Great that we are saved by those we despise. “The idea that God uses people we regard as unimportant or as offensive to save us by teaching us humility, which Gregory saw revealed in Christ’s life and in the stories of the Old Testament saints, had become quite commonplace (by Clare and Francis’ time). Rather than demanding the recognition of rights, Franciscan reform demanded a willingness to be despised in order to save others…this idea makes Franciscan thought and reform largely inaccessible to people who privilege current categories of thought…Ideas such as inherent rights and modern notions of freedom would not begin to appear until roughly five hundred years later. Both Clare and Francis subscribed to the idea that the path to peace was poverty. They would not have understood contemporary ideas that there will be no peace until there is justice. 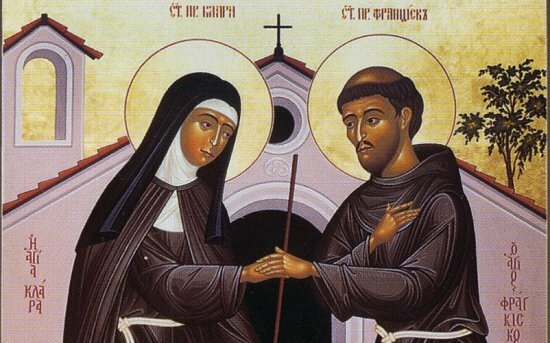 Instead, Clare and Francis believed it was necessary to give others more than they deserved to establish peace. In fact, there is something radically, and Clare said ‘wonderfully’, subversive about Francis & Clare’s desires and actions to give those who are corrupt more respect than they deserve. By giving the corrupt more respect than they deserve, Francis and Clare were imitating the way Christ desires to give to sinners the grace they do not deserve. Franciscan reform hopes to compunct the sinner into reform.